Depictions of girls wearing sunbonnets that hide their faces seem to have begun to appear in the 1870s or 80s, and became a popular icon seen on china, postcards and quilts. It was in 1902 (or possibly 1900, there seems to be some dispute) that the imagery was first incorporated in a popular book series by Eulalie Osgood Grover and Bertha L. Corbett. They nailed down the representation in its now familiar form, though they were neither the creators nor the only marketeers to ply the 'sunbonnet trade'. 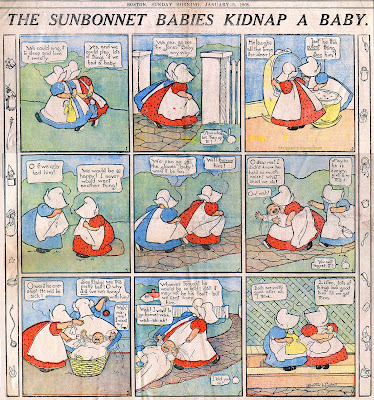 Bertha Corbett created a short-lived Sunbonnet Babies Sunday comic strip series which first appeared on December 8 1907. Her sometimes partner Ms. Grover doesn't seem to have been involved, or at least wasn't credited. In the Boston Globe the series ended on October 18 1908. The syndicate responsible for distributing the series is uncredited and unknown, and the strip appeared in papers that took varying syndicate offerings. If I had to guess, I would say the feature was syndicated by a publisher (maybe Rand McNally?) as publicity for the book series. Alfredo Castelli in Here We Are Again adds credit to Grover on the strip, but I've never seen that credit actually included. Here's a website with more Sunbonnet Babies history. Better to play with a doll than to resort to kidnapping, I suppose. I would have thought it tough to achieve a lot of interest in this concept. There's not a lot of personality in look-alike characters with no faces! Very cute. Sunbonnet Sue's are classic quilting patterns. I guess someone thought they needed their own comic strip. The Sunday continued in the Boston Globe until October 18, 1908. I have that last page before my eyes, so expect a copy by email. I don't see any Grover credit either, though. Bertha L. Corbett was born in Colorado on February 8, 1872, according to the California Death Index. The Corbetts lived in Denver, Colorado; her father, Waldo, was listed in the "Corbett, Hoye and Co.'s Annual City Directory City of Denver" from 1876 to 1879. In the book "History of Arkansas Valley Colorado 1881", Mr. Corbett was mentioned as a member of the Knights of Honor in Leadville, Colorado. Sometime later, the family moved to Minnesota. In the 1895 Minnesota State Census, Corbett was the oldest of three children born to Waldo and C.E. They lived in Minneapolis. On July 19, 1896, the Saint Paul Globe (Minnesota) reported the results of an art contest for the cover to the Big Store Fall Fashion catalogue: "The third prize, an English fob seal watch chain, was awarded Miss Bertha L. Corbett. Her design represented autumn and winter by two sweet faces appropriately arrayed." According to the 1900 United States Federal Census, the family lived in Minneapolis at 3404 Chicago Avenue. Her mother had died between the state and federal censuses; her father was a sign painter. The Minneapolis Journal (Minnesota) published an New England Bazaar ad, on February 6, 1901, which featured "Valentine Novelties By Bertha L. Corbett; the cutest things ever seen. 'Sunbonnet Baby' Valentines, absolutely unique, artistic and dainty." The Kansas City Star picked up a story from the Minneapolis Tribune about Corbett; excerpts, from March 26, 1902, on the Sunbonnet Babies. A different account of her Sunbonnet Babies origin was given in the Kalamazoo Gazette-News (Michigan) on June 29, 1902.
no face appeared and yet the picture told its story. and developed as healthy children will, until the oldest are 4 years of age. written by Miss Eulalie Grover…. Christmas time, four years ago…. Corbett's Chicago studio was mentioned in the Minneapolis Journal on October 22, 1905.
exhibited in chalk talks by their creator. On September 20, 1906 the Minneapolis Journal reported her venture into advertising. At present she is associated with R.F. Outcault of "Buster Brown"
The Evening World (New York) published an ad, on May 31, 1907, touting the success of its Sunday art supplements. them as illustrations of a series of art lessons to New York City readers. It has now been decided to give the set to out-of-town readers. Each picture in colors. Just the thing for framing or passepartouting. 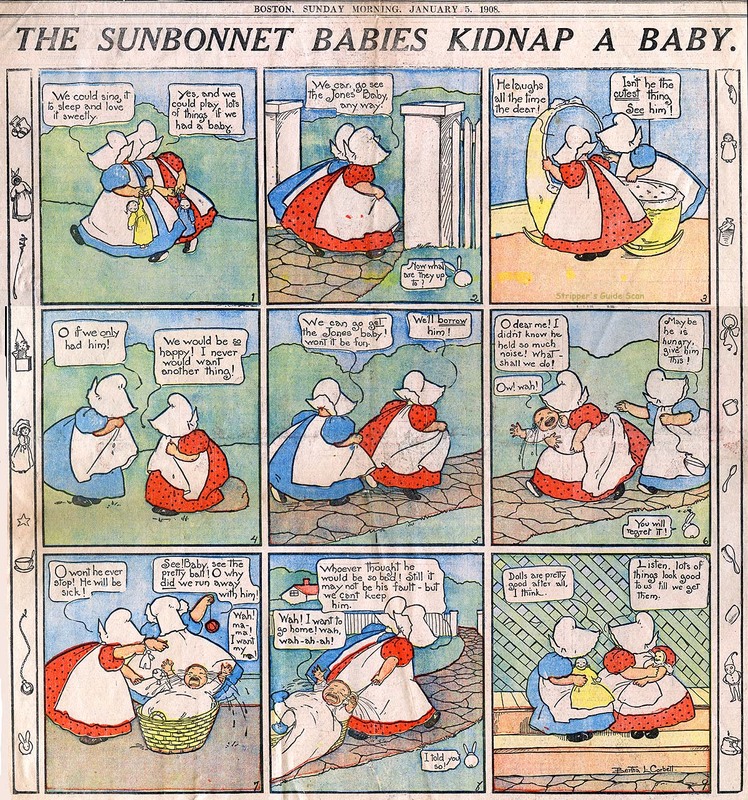 Perhaps the Evening World's sunbonnet series prompted Corbett to develop her comic strip, "The Sunbonnet Babies", which debuted in the Boston Globe on December 8, 1907. Corbett was counted twice in the 1910 census. She was a roomer in Chicago at 4541 Prairie Avenue; her occupation was artist in a studio. And she was counted as a member of her father's household in Minneapolis at 203 14th Street. Later in 1910 she married George H. Melcher, who was an artist and 10 years younger. In 1920 the Melchers and two daughters lived in Calabasas, California. The husband and wife were artists at a studio. The Melchers remained in Calabasas in the 1930 census; George was an artist and Bertha was an illustrator, both independent. According to the California Death Index Bertha C. Melcher passed away on June 8, 1950. Thank you Leonardo, for the info and the scan! My guess is that the Globe moved it to another section that didn't make it onto the microfilm I reviewed after my end date, or those Sunbonnet pages were pilfered before microfilming. Not as rare an occurrence as I'd like. This is exactly the reason I try to note discrepancies in dates between what I have and those in other works. Not trying to play 'gotcha' just trying to get to the Truth. I'll amend the post and my SG listing. And to Alex, thank you as always for the biographical research. The word 'passepartouting' sent me scrambling for my dictionary. Turns out it is "a picture simply mounted between a piece of glass and a sheet of cardboard stuck together at the edges with tape." There really is a word for EVERYTHING, isn't there! Thank you for the great information about Bertha Corbett Melcher. My wife is giving a presentation to a group and I was attempting to find information about this illustrator for the Sun Bonnet Books. The information posted has, indeed, filled in the gaps in what I had been able to find. For more information on Bertha Corbett Melcher see my article in the Spring 2010 issue of Minnesota History. Can you help me identify a character? I recall a comic from the 50's or 60's which featured a small, presumably old, hill-billy woman. She was always turned to the side and she wore a sunbonnet which concealed her face and she smoked a corncob pipe and wore a dowdy dress. I am reminded of Mammy Yokum from the Little Abner strip, but she is portrayed differently. Thanks for any help you can give me!